Red Tiger Gaming is one of the recently founded online casino software providers. The company has been around since 2014. Despite the fact that it has been present in the industry for a relatively short time period, it has already shown a wealth of experience especially when it comes to its video slots collection. The company actually has decided to take a different, authentic approach with their latest release named Spin Town. Spin Town slot is a highly unusual, visually appealing game that comes packed with 5 reels and 40 paylines. The game’s theme is also highly unusual. After doing Asian, Greek, Irish, Mexican and Norse-themed games, Red Tiger Gaming decided to turn to England when manufacturing Spin Town. 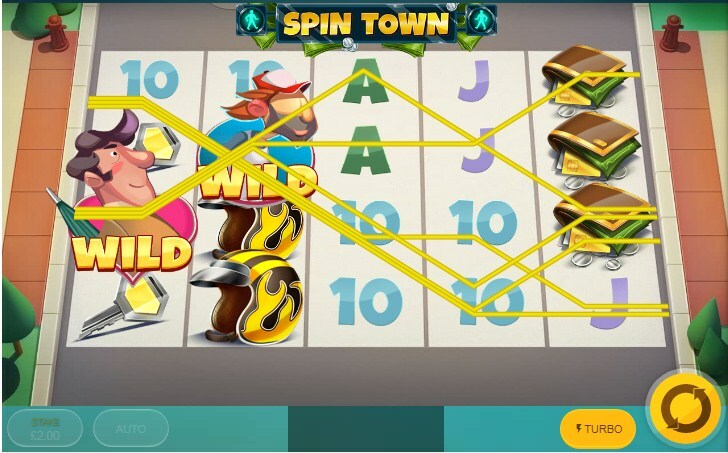 With the very first spin on the Spin Town slot, players travel to an old town in England where they are greeted by neatly rendered symbols. The main setting of the game is actually a cartoon road at which symbols featured in the game dance across hopefully bringing generous payouts. The game definitely features some unusual actions and bonus features in addition to being neatly rendered packed with top-notch graphical solutions and remarkable animations which perfectly match the game’s engaging sound effects. While the game is beautifully rendered with its reels packed with interesting symbols, the biggest attraction of the game is its bonus feature. In fact, Spin Town slot comes packed with a myriad of wild symbols which can actually gather on the reels’ edges. Once there, they wait for the green light to appear and they start crossing the game’s reels while at the same time they produce winning combinations. There are several different types of wild symbols featured in the game including the sleepy wilds depicted by the old couple. These wild symbols randomly appear on the reels and they stay in their positions for some extended time period. There are also the speedy wilds which move across up to two reels. Moreover, the game also featured the couple wilds which can actually bump into each other while crossing the reels. When they bump into each other, they provide a great 2x winning multipliers while they also continue to yield more wild winning combinations. In addition to these valuable wild symbols, this Red Tiger Gaming release is also packed with several other bonus options including the Wild Rock’n’Roll shuffle and the Guardsmen’s March which also provide more generous winning opportunities. This highly unusual, bonuses-packed game is actually a low volatility game with RTP around 96.07%. Betting options range between 0.20 and 200 coins per spin.